San Francisco has any number of neighborhoods like the Mission or SOMA or Castro and what not. But there are parts of town that are on the fringes of hoods and seemingly cross over from one to the other such as TenderNob--the space between the Tenderloin and Nob Hill. These combo name hoods are really more for locals but sometimes these areas in between are more ambiguous like say the area around Franklin Park to the West of Portrero Avenue and East of South Van Ness. It's not really the Mission and not really Potrero Hill--more like MissTrero? Though it doesn't have a combo name. What does this have to do with anything? Well, nothing really but me and the SO decided to grab brunch one early-ish Sunday morning and I suggested we head out to this spot of town thinking we could slip into Universal Cafe (a place I hadn't been in ages) but alas, even 10:30 am was too late as a waiting crowd had already amassed outside. Thus we set our sights on another place a few blocks away and voila we were able to get into Slow Club before their rush eventually packed the place (which it did). Meat, it's whats' for dinner. And particularly so in San Francisco where things seem to be moving away from the vegan friendly ways of yore to things much more meat centric. This can be seen with the recent openings of 4505 Burgers & BBQ, Magnolia Smokestack, the various barbecue joints that have popped up over the years and also the addition of barbecue to places that have been around awhile. 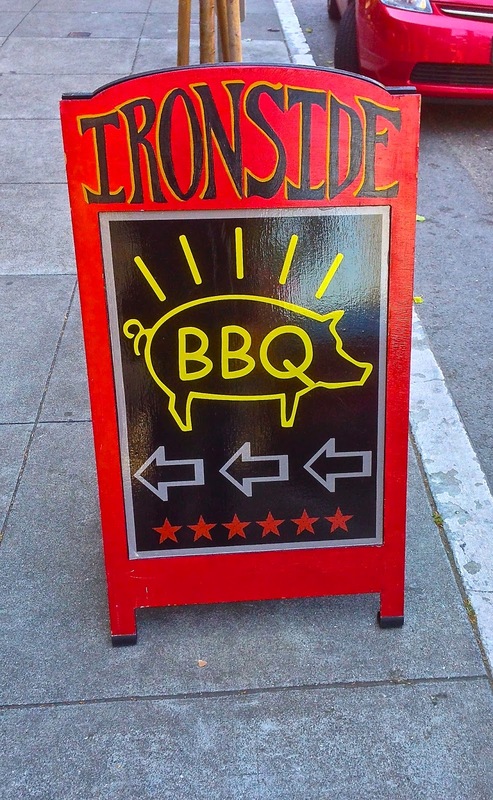 One of these such places is Ironside in SOMA who've rolled out a whole menu based around smoked meats. I live near this place and me and the SO had been here on a couple of occasions to just grab a burger or on Sunday when they have their all you can eat brunch for $16. (It's pretty good) They had a fairly standard "American Fare" menu, but when they put out that BBQ sign to introduce their new menu I knew I'd have to go and see if it was any good since I'm always on the look out for some good meat. Burgers, really, what more can be said about them that hasn't already been covered. It's meat, a bun, some toppings and some sauce. A fairly simple recipe that like pizza, when done right is really good, when done badly, well, add more mayo and it's still edible. I've had innumerable burgers over the years and while they've been done in most all conceivable ways, I can't really think of one that was so gawd awful that I couldn't finish it. Overcooked and a little dry, maybe, but usually I'd send that back to be redone or just sauce it up and chow on. Still even though burgers are continually written about I'm always up to trying one when I'm in the mood, such was the case that brought me to Roam Artisan Burgers and it's original location on Union Street. I remember hitting up this place way back when it first opened and at the time not being all that impressed. They were part of that locally sourced, all organic trend that was just beginning and I just took it as another place serving an overpriced thing that was no bigger than my hand. Now that they've had a few years under the belt (and two additional locations) I stopped by on a weekday afternoon when they weren't busy to give them another try. TABLE FOR ONE: EATING SINGLE IN THE BIG CITY....TAQUERIA!! I think at this point you get where this is going and just how deceptively simple solo dining can be in this town. We've all heard the saying about feeling so alone in a city so full of people and San Francisco is no exception. I, however, feel one should embrace this from time to time to not only get in touch with oneself but also to have the unfettered opportunity to go out to a place, sit by yourself without conversational interruption and just watch the meandering masses that parade before you. This town is rife with eccentricities and odd folk and I mean that in an enjoyable, let's embrace our crazy cousins and show them off kind of way. (Much like they do in the South) And what better place to peruse, ogle and be amazed by folks around than a taqueria. Chocolate peanut butter cake from Sweet Inspirations in the Castro. The chocolate/peanut butter needs to be evened out a little bit but this was a tasty moist delight. Why term "farm to table" needs to be sent to pasture--get it? Sent to pasture? Ugh.. It's all about meat in SF as 4505 Burgers & BBQ and Magnolia Brewery Smokehouse open. Bay Area Beard Award winners see familiar faces. Here's a story on a now no longer secret crepe shop in the Mission. Things you didn't know about Blue Bottle Coffee--in case you are obsessing. Thomas Keller opening ice cream shop? How much will that chefs tasting be? 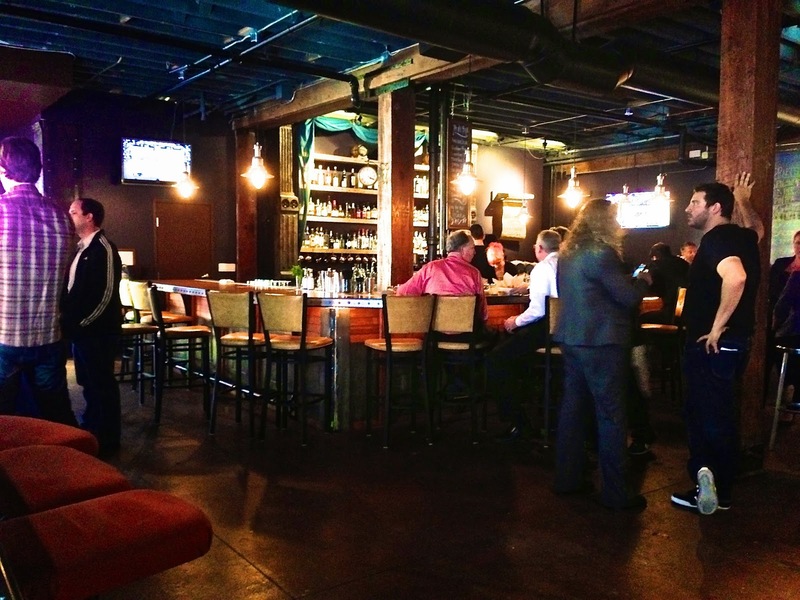 Schroeder's Beer Hall reopens in San Francisco and all the media are excited about it. Here's the full list of SF Weekly's Best of...Food winners. SFist's list of the best San Francisco markets for international foods. Dogpatch continues its journey toward foodie town with a forthcoming wine distillery. Here's a rundown of Off The Grid's Picnic At the Presidio vendors. And this is the carrot cake from Sweet Inspirations, very good and creamy. Double props to the shop for also giving healthy slices. I love a good doughnut, hell, I even love a not all that good doughnut. For me, next to cake, they are a perfect dessert offering both the doughy heft I enjoy plus with all the varieties you can throw in some possibility of icing or frosting and some type of luscious filling. Everything you (or me) want in a dessert all in one. Plus the fulfill any late night or anytime sweet craving I occasionally have as there is an All-Star Donut always open somewhere on some corner in this town. Now combine that availability with food truck mobile-ness and you get Johnny Doughnuts. Their original location is a brick and mortar place in San Rafael but they have a food truck version now roaming the streets that I will tell you now, if you see the below truck, try it, much like this crowd did. Chefs working hard at Benu, a place I hope to be able to afford to try one day. Meet that Wes Rowe guy of Wesburger fame. Or just have a burger. Twitter building becoming foodie central. But will us regular folk be able to get in? Pearl's may have cut and run from 6th and Market, but Homeskillet is giving it a try. Chicken wings get makeovers and upgrades at Bay Area restaurants. Sneak peek of Dirty Habits cocktails, you know for techies with tokens. Not your average tacos to try in San Francisco. Dennis Lee on traveling for BBQ and the upcoming Smokehouse for Magnolia Brewery. The croissant boom is happening because.....why? The state of desserts in the Bay Area..here's what local chefs want you to think. Photos of the finally opening Urban Putt have surfaced. A taco inspired IPA because...hipsters? Inside the new Victory Hall serving up selected grub and more from Little Skillet.